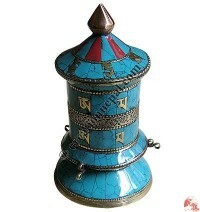 Prayer wheels are a part part of Tibetan culture especially the life style in Tibetan Buddhist community. 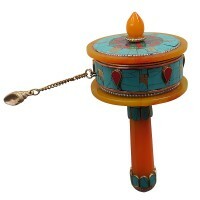 The day begins with the spin of Mani, the prayer wheels as the belief of well being. 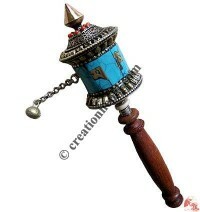 Creation Nepal offers different styles of Tibetan prayer wheels that are entirely handmade in Nepal like hand prayer wheel, table prayer wheel, wall attach prayer wheel etc. 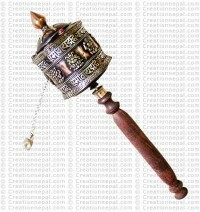 Buddhist prayer wheel online at great price. 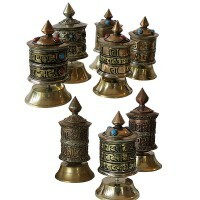 Prayer wheels are the most common Buddhist religious objects in Nepal Tibet. 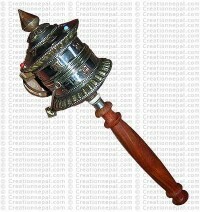 A hand held prayer wheel is a hollow wooden or metal cylinder attached to a handle. 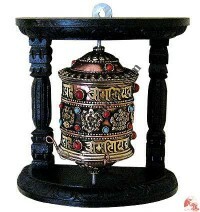 Om Mani Padme Hum mantras are printed or etched in relief on the cylinder. Attached to the cylinder is a lead weight with a chain, which facilitates the rotation. 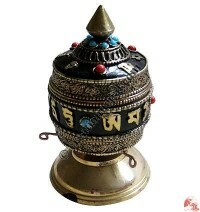 Tibetans use prayer wheels to spread spiritual blessings to all conscious beings and pray to good karma in their next life. People believe that every rotation of a prayer wheel equals one utterance of the mantra, thus the religious practice will in return help them accumulate merits, replace negative effects with positive ones, and hence bring them good karma. People turn the wheel day and night while walking or resting, whenever their right hands are free while murmuring the same mantra. Buddhists turn the wheel clockwise. 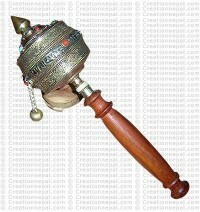 Buy Nepalese handmade Tibetan prayer wheels online ! 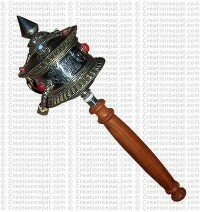 We, as a prayer wheel shop, Creation Nepal offers different style prayer wheels including antique Tibetan prayer wheel in various size and styles at great price. 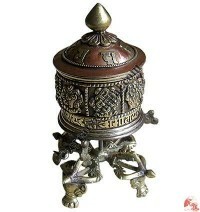 Whether it is wall mounted prayer wheel or table prayer wheel we have wide range of Nepalese handmade Tibetan prayer wheels made of brass, copper or white metal using stone beads, stone chips to decorate the prayer wheels. 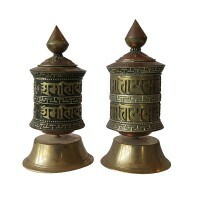 Here we offer different size and style prayer wheels like tiny copper prayer wheel, wall hanging small prayer wheel, table stand single prayer wheel, single pannel stand prayer wheel, small Mantra spinner, table stand small prayer wheel, table stand two prayer wheel, table stand wooden large prayer wheel, decorated Astamangal prayer wheel, decorated Mantra prayer wheel, 2-line black base mantra wheel, 2-line mantra XS prayer wheel, carved Buddha filigree prayer wheel, single line mantra tiny prayer wheel, mini prayer wheel, tiny prayer wheel in wholesale price. 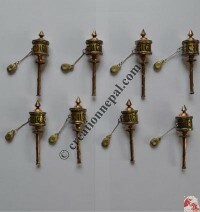 More varieties of Nepalese handmade prayer wheels are: tiny table stand prayer wheel, painted mantra stand prayer wheel, 3 in 1 decorative prayer wheel, table-stand decorative prayer wheel, 4 in 1 decorative prayer wheel, filigree decorated stand-prayer wheel, small copper prayer wheel, auspicious signs prayer wheel, stand 4-step Mantra prayer wheel, stone setting filigree stand prayer wheel, copper stand Om Mane prayer wheel, antique looking prayer wheel, tiny prayer wheel, table stand wall hanging prayer wheel, filigree mantra prayer wheel, engraved Mantra prayer wheel, 5 lines Mantra tiny prayer wheel, 4 step Mantra Mini prayer wheel, Om Mani Mantra filigree small prayer wheel, wall hanging prayer wheel, large prayer wheel, medium prayer wheel, filigree prayer wheel etc. 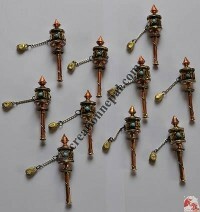 are being supplied online at great price.